“Low-melting” metal alloys, heated in this safe electric pot, are poured into dies and cast as soldiers, animals and the like. An engrossing occupation This elaborate kit contains the parts for 406 models, of which the four-ft. locomotive at the right is not the least. The boy who likes to do things will find years’ work here. This automobile is 25 inches long. When the spiral rod at the rear is pulled out and released, a spring pulls it again forward; the rod turns a gear and the motion is communicated to the rear wheels. The figure at the left, which bowls the balls down the alley as in a real game, is mounted on a swivel so that it can be controlled by the player. The toy has also a self-acting ball return and an automatic magnetic pin setter. With “just enough” snap, the small steel ball can be driven around the spiral to drop into the second hole from the end, and produce a high score, but it requires skill to do so. The locomotive shown above, built from the kit at the upper left, is operated with remarkable realism by means of a small electric motor which is included in equipment. A powerful small spring motor, made in the form of the familiar outboard engines, drives this model for a long time and at a good rate of speed. Turning the propeller housing steers the boat. This giant roller coaster” is 42 inches long and 12 inches nigh, steel balls as counterweights lift the car to the top of the tower, in a special elevator. An ideal toy for the youngster who is too small to operate a wind up toy. The little bouncing figures, like tumbling dolls, count for scores in accordance with the holes in which they seat themselves— if the player’s aim is good. The quoit throwers at the left pivot, in order to give better aim at the peg, which is to be ringed by the shot. An outdoor game, invented by an aviator, which combines skill and exercise. The parachutes are brightly colored. I want that Erector set! Charlie – the text is all jumbled (sentence by sentence) in the transcription. Toronto: It’s all captions so the order is kind of arbitrary. Generally for these I do the OCR just so it’s searchable. Die casting used to be considered safe for kids. Nowadays, toys that were made from the metal in that kit would probably be recalled immediately on the off chance that someone would eat one and develop cancer. The kit for the Locomotive looks interesting, but then I suppose I would choke on the parts….like Benzene265 will die from cancer. 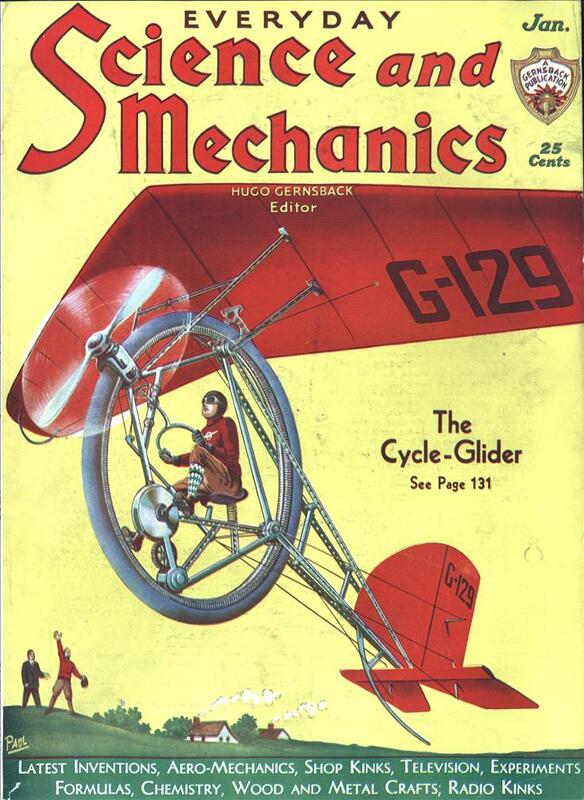 P.S I clicked on the cover Icon, How strong would one have to be to peddle that Cycle glider? 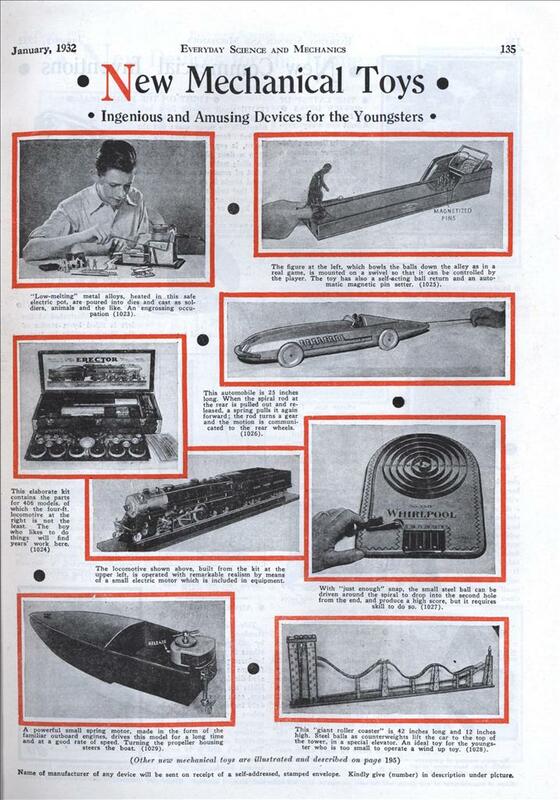 BTW, the “paradarts” on the second page were also an extremely cool toy. I seem to recall losing one in a redwood tree near Eureka once. C.H. : Here you go. Just look on eBay Opening bid is $3960 bucks.